As an investment ‘prospect’, Infigen is all about bleeding cash. It backed up a $55 million loss in 2011/12 with an $80 million loss in 2012/13 and keeps losing money: booking a $9 million loss in 2013/14; and has just racked up a whopping $304 million loss for 2014/15. In an effort to spin away its losses in 2013/14, Infigen pointed to …. wait for it … THE WIND – as the reason for a massive drop in revenues (as pitched to wind power worshippers, ruin-economy). Now, in the mother of all ironies, Infigen – trying to brush off its monumental $304 million loss for 2014/15 – once again levels the blame on “PARTICULARLY POOR WIND CONDITIONS” (the pitch again appearing on the pages of that august journal, ruin-economy). But should Miles and the gang really be complaining? 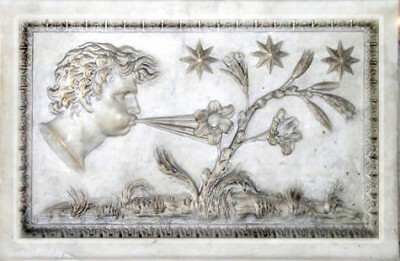 After all, the wind is – as they repeatedly tell us – “FREE”. Which calls to mind the old chestnut about “getting precisely what you pay for”. The malice of the Wind Gods isn’t all that’s troubling Miles & Co. These boys are still scrambling to get development approvals for all of its Australian projects – so they can be flogged off ASAP, and the cash used to ward off the receiver. But, no luck: in the current climate, its chances of finding buyers are slimmer than a German supermodel. In an effort to hose down that PR disaster, Infigen has dropped its threats to the farmers concerned, which will pretty much scuttle Infigen’s hopes of flogging its Flyers Creek proposal (see this article). But, as with everything Infigen plugs, its stated aims look more like ‘dreams’, which – as every one in creditor and investor land knows – don’t often translate into satisfied debts or realised profits. Instead of bagging $500 million, it managed to pocket a little over half that. Infigen Energy, an Australian clean-energy developer, will sell its U.S. wind business to Primary Wind Power, LLC, for about $272.5 million. The transaction is expected to close by October, Sydney-based Infigen said in a statement Wednesday. Infigen has an equity interest of 1,089 megawatts across 18 wind farms in the U.S.
Infigen’s U.S.-based employees will become staff of Primary Wind Power, a newly formed company affiliated with ArcLight Capital Partners, LLC, according to the statement. The sale is not expected to have any effect on the “business as usual” operational requirements of the Australian business, Infigen said. What’s that they say about not counting chickens at any time prior to their emergence from their crusty cocoons? 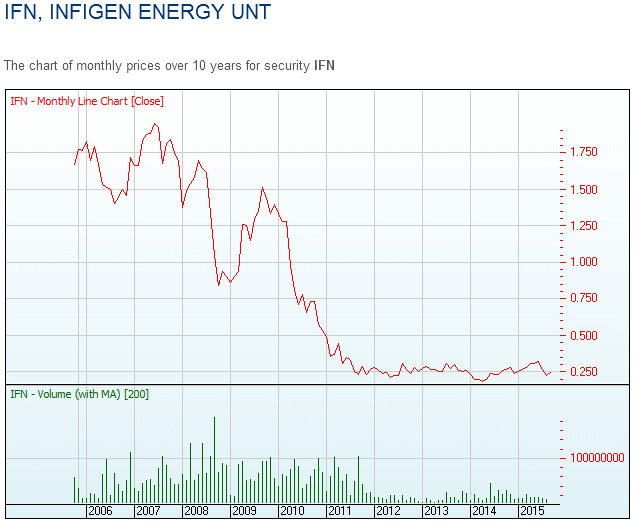 Here’s more on Infigen’s imminent collapse. Wind power producer Infigen Energy will seek to tap into growth driven by the revised renewable energy target by selling projects and joint venturing on others after reducing debt through the sale of its US portfolio. After a full-year net loss of $303.6 million, mostly on a write-down of the US business, Infigen said it could now pursue profitable growth in Australia because it had cut risk and simplified its business. The loss widened from $8.9 million the previous year. One joint venture agreement has already been signed with an unidentified wind turbine supplier, covering the potential 50:50 development of the Bodangora wind farm in NSW and the Forsayth project in Queensland. Others were expected to follow, but potentially not until 2016, when the “big three” energy retailers – Origin Energy, AGL Energy and EnergyAustralia – should resume committing to long-term purchases of green power to satisfy their renewable energy target liabilities, managing director Miles George said. Infigen has 1200 megawatts of large-scale wind farm projects that already have development approval and could be sold to third parties, or developed jointly, with Infigen keeping a minority stake. About 5000-6000 MW of new projects will be required to meet the revised renewable energy target. But one analyst said Infigen might face difficulties selling projects given a shortage of buyers and little sign the large retailers would resume signing long-term power purchase contracts. The company, formerly known as Babcock & Brown Wind Partners, said wind conditions should improve this financial year after a below-average 2013-14, while hedging has been put in place to make revenue more certain. It is also seeking to extend service and maintenance agreements with third parties to reduce exposure to costs for replacing parts. Mr George said the outlook for the Australian business was “positive” following the passage of the amended renewable energy target legislation, which gave more certainty over policy settings and required a near-doubling of large-scale renewables capacity within five years. “Infigen is well positioned to participate in those opportunities with its significant and well-advanced development pipeline,” he said. The net loss in the year ended June 30 stemmed largely from a $US221 million ($309 million) write-down on its US wind business, which has since been sold. The loss from continuing operations was $18.4 million, an improvement on the $32.4 million loss of the previous year, on revenue that slipped 8 per cent to $133.8 million. Infigen shares dipped 1.8¢ to 22.7¢. The sale of the US business for $272.5 million, expected to be completed in October, will allow about 25 per cent of Infigen’s heavy debt load to be repaid, reducing net debt to about $647 million. Infigen said it expected to repay about $35 million of the debt facility this financial year, apart from the proceeds from the US sale. One thing Miles George will never be accused of is a lack of optimism! But pinning your hopes to the wind; and to Australia’s mega power retailers – who decided long-ago to kill the LRET Subsidy scam, upon which Infigen & Co critically depend (see our post here) – is not just ‘upbeat’, it’s downright ‘delusional’. Backing up multi-million dollar loss, after multi-million dollar loss (a lazy $448 million, since 2011) reminds STT of Albert Einstein’s quip about ‘Insanity’: “doing the same thing over and over again and expecting different results”. From STT’s brush with business school, the concept of offloading assets is about getting rid of the loss-making parts of an enterprise, in order to inflate the balance sheet and the net value of the firm, which is usually about avoiding a takeover bid. But, doing so in a sweaty, hurry, is usually about facing down the much more serious threat of a major creditor signalling that it’s about to move to recover what it’s owed. When a company keeps telling the world that it’s on the brink of collapse – as this one seems to do on a daily basis – the dissipation of its income earning assets, is usually the last straw. Creditors – sensing that the chances of getting anything back at all will vanish, along with the debtor’s assets being put on the auction block – generally circle the wagons pretty quickly, in an effort to secure something from the distressed company’s fast-dwindling pile. With close to $1 billion in escalating debts (the SMH piece talks about ‘net debt’ of $647 million, after the US wind farm fire-sale) and mounting, massive losses – Infigen is unlikely to last much longer. The whole idea of holding (notionally) income producing assets is, funnily enough, to earn and receive income. By ditching its US wind farms – and planning to offload its Australian projects prior to building them – not only does Infigen put its creditors and investors at even greater risk of never recovering a penny, it cuts its revenue stream at a time when – you’d think? – it was looking to pocket every last cent – in order to keep its banker and creditors at bay. this opportunity to locate your nearest exit. Miles George – His parents were a little confused as to what to name him, as they weren’t quite sure what he was.